In most countries, religion (or faith tradition) plays a key role in determining public attitudes toward the values its citizens hold. Because altruism and end-of-life care are so tightly coupled with successful organ donation, many scholars believe that a country's dominant religion significantly influences its organ donation rates. While most religions and faith traditions are supportive of organ and tissue donation, as you can see in the graphics on this page, there is much variability between donation rates between countries. In general, predominantly Muslim countries tend to have the highest living donation rates, whereas predominantly Christian countries tend to have higher deceased donation rates. 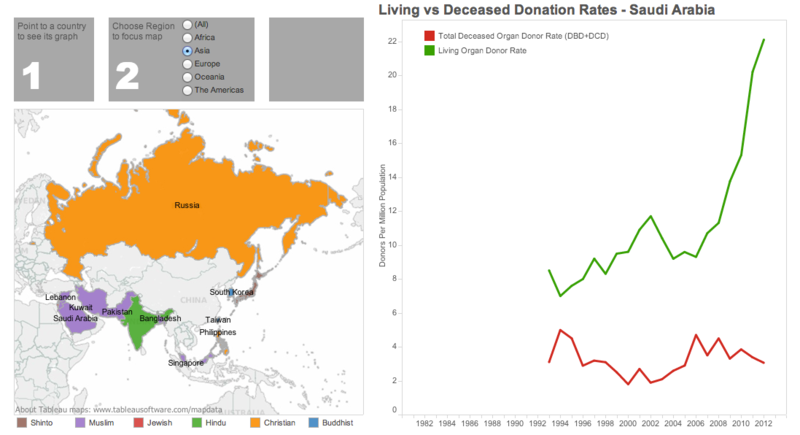 You can model and compare the impact religion may play on a country's living and deceased organ donation rates by positioning your cursor over the regions on the interactive map above.